jBPM Designer already includes a number of useful input editors for things like Process Variables, Task Data Inputs/Outputs, Task Assignments, Imports, Called Elements, etc but often the out-of-the-box ones are not enough and users find themselves wanting to be able to create and use their custom Input Editors for certain BPMN2.0 node properties. I’m happy to say that this is now supported! Below is a step-by-step example on how to create a custom input editor for the Actors property of user tasks. Click on the images to enlarge. Custom Editors provide a very powerful and useful way to add domain-specific ways of handling data inputs. Your custom editor could for example contact your existing web services or do pretty much whatever you want which is a great way to further enhance the usability of jBPM Designer. Custom Editor support is currently available in jBPM Designer master branch and will be part of the next release scheduled in the next weeks. This entry was posted on Tuesday, July 3rd, 2012 at 4:28 pm and is filed under Uncategorized. You can follow any responses to this entry through the RSS 2.0 feed. You can leave a response, or trackback from your own site. Not sure I understand your question – custom editors are part of the Designer UI, and not Drools Guvnor. but how i can use custom editor in Drools Guvnor? I don’t think that Guvnor currently has the ability for users to define new / change existing editors. You might want to ask that on the Drools users mailing list. But users can still enter free text in editor. How can I make this editor to have the behavior of Choice editor but with custom items(selectable from that graph for example)?. You can define a static set of options in Designer which will be displayed as a drop-down list. These elements are not dynamic. Raise a jBPM Jira for this and we will figure something out. Can I add a risk management feature button on the editor? So when I run the simulations, it will show me risk details as well? You can extend the jBPM Designer to add your own plugins. 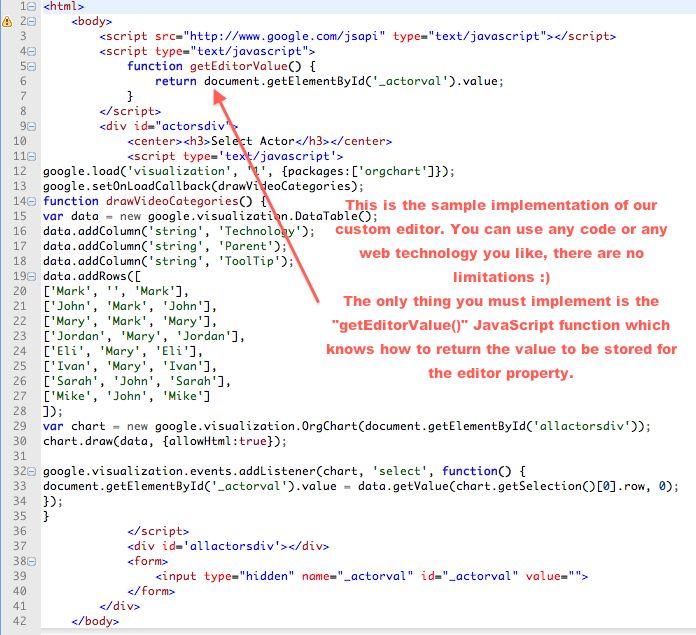 Yes you can define them in plugins.xml and also place them as include in inlineeditor.jsp. Let me know what you are working on and if you’d like to make your work a community contribution at some point. I’ll be happy to help with integration as well. Hi, can I set parameter value to editor? I want setup value from parameter to editor. 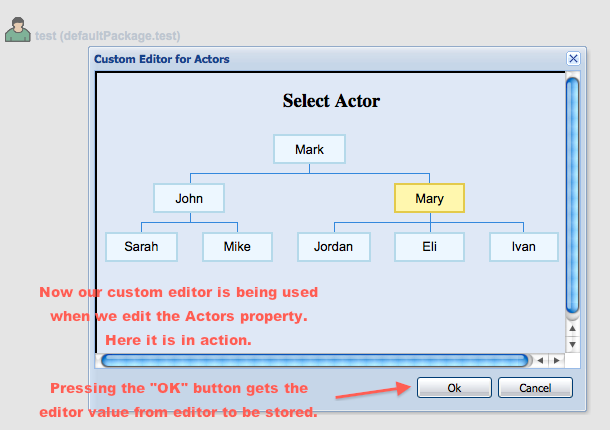 In example there is only default editor (customactorsvalue).